If you like to have large surfaces and lots of storage space, you will love Jumbo AV Presentation Carts. These AV carts provide the space you need for audio visual equipment, with room to spare. The extra-large top surface fits larger equipment while the adjustable-height laptop shelf enables you to give presentations from both seated and standing positions. A spacious locking cabinet with an adjustable shelf is great for larger electronics or additional items that are needed for presentations. These versatile AV carts are sure to gain quick popularity among teachers and professionals. But there is no need to worry about getting them from place to place when they are in high demand. These sturdy carts roll easily into position on large casters. 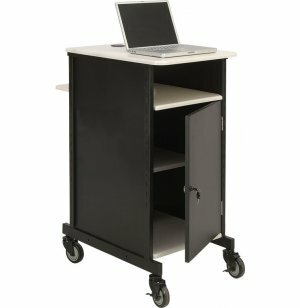 Jumbo Design: This cart features an extra-large top surface, an adjustable-height laptop shelf and a spacious locking cabinet with an adjustable removable shelf. Strong Materials: Heavy-duty steel frame with medium-density fiberboard core panels. Attractive: The ivory wood-grain melamine will look great with any room décor. 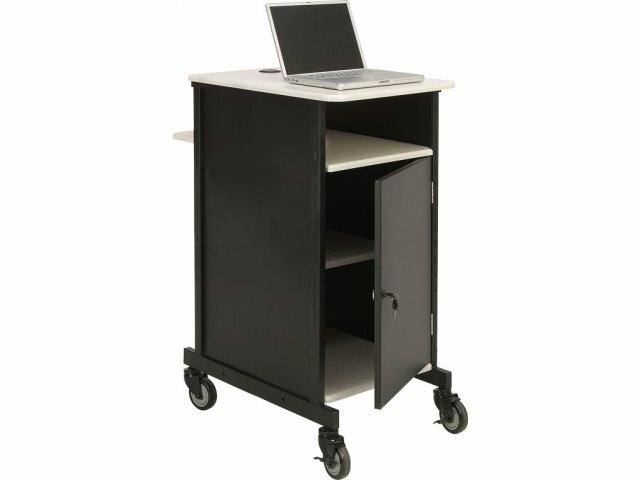 Smooth Rolling: Easily moves from room to room on 4" casters (2 locking).